The Shannon Technique is a system of root postions for the body in relation to the crutch, weight distribution and the floor. Through the use of Shannon Technique individual and unique choreographies can be realized. here is a brief bit of writing to supplement the video. 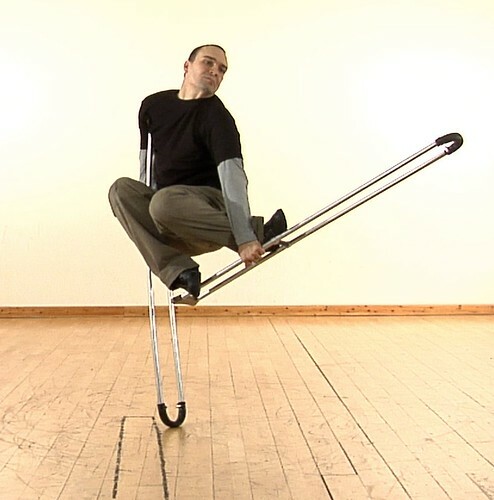 Shannon Technique is a defineded set of physical movements in relation to the employment of crutches for dance and mobility. This technique was born out of a utilitarian movement on crutches created in my childhood while playing. The roots of the form are based on necessity of the moment as childhood would have it. There was no plan or design for the creation of this technique. There were the demands of the moment in childhood and then the focus and refinement of the results of those demands in my adulthood. The result is the codification of a technique to be shared with the world. The verbalization and categorization of the movements which makeup the technique came about within the process of creating group work and training others to move on crutches in creative ways. This codeification of my movement into a technique became necessary when I realized that the practicality of acheiving basic body positions in relation to the floor was not readily apparent to most people I observed in the general realm of movement experimentation on crutches. I would consider Shannon Technique a root from which all sorts of possibilities might flower. This root is simple in its details and subtle in its execution but critical to the realization of smooth transitions between levels of the form in relation to the floor. The practicality of having names for my moves and foundation elements became obvious in the teaching process. Prior to this time I was the sole creator and performer of the technique and therefore without a need for names. Terminology developed to refer to specific foundation positions on the crutches include SADDLE, HIGHMIDS, LOWMIDS, SPLITMIDS, FLOORWORK, and AERIALS. Names of some specific moves which refer to the cultural influences on the form include moves such as the SWEEPER, FLOATS, FINGERFLIPS, TOEFLIPS, THREADS, FRONTSIDE AIRS, HEELHOLDS, JUDOS, and FLARES. Names specific to the demands of being on crutches include FOREARM STALL, ELBOW STALL, NOHANDERS, NOFOOTERS and others. The technique is also based on a set of parameters of what your body is and is not capable of doing. IN many ways the technique is wide open to new developments for an individual without a concern for pressure in the hip. The idea of my first student was for him to take the technique where I could not go.